One thing that makes a model really stand out is a sweet custom base. Anyone can purchase some fancy premade resin bases, but at some point even those are going to get repetitive across an entire army. Here's an example of a very old base that I did. Despite my best attempt to spruce it up, it still ended up looking rather flat. I find that building custom bases is a really fun exercise. Once you get the hang of it, you can come up with an amazing variety of interesting things. The possibilities are limited only by you're willing to experiment with. Here's another example of an older model of mine. The flatness of the base is really noticeable on this one. Were I to redo this model today, the base would look much more dynamic and realistic. At the easy end of the spectrum of base enhancement is simply adding some gradient to the bases. Even this simple act adds much to a finished model. Once you do it to a number of your models, it will look really bland when you see a model based and flocked on an unaltered flat base. The goal is to add some putty to the base so that it doesn't look flat. The type of putty doesn't really matter. Extra GreenStuff, ApoxieSculpt, or whatever you have the cures hard. I go with ApoxieSculpt, as it's plentiful and affordable to use for this application. One important thing to note here is that you need to either score the base up with a modeling knife or similar tool before applying the putty, or use super glue to attach the putty. I've had the putty start to separate from the bases of a few models in the past, and this little bit of effort will prevent that. If you do at some point notice your putty separating from a base, due to lack of this foresight; just put a drop of liquid super glue into the separation, and hold it down. You may have to touch up the paint on the edges of the bases in that situation, but you'll preserve the model. This technique of adding gradient to the base can be done before or after the model is glued to it. It really depends on the model. I've found that Beastmen Gors and Ungors have plenty of open base space to add putty to after the fact. Opposingly; Dwarfs do not. Once your base is scored up, it's just a matter of randomly spreading a putty ball on it. Don't spread it evenly. There are many occasions when building up a putty base can make a conversion possible. In the below image of the base of my Jabberslythe for instance. The only part of the Jabber that touched the base was the tip of his toe, and a small part on his tail. I ended up pinning the toe to the putty on the base with a rather thick brass rod. This model would never have stayed attached otherwise. When doing this type of thing to spruce up your bases, be as random as possible. Leave a high side, and a low side. Leave a big bump in the middle of the base. Leave a peak that goes across the base diagonally, or from edge to edge. Do whatever you feel like doing that is different from the other ones you've done. 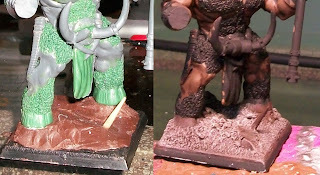 Another example of using putty on a model's base for functional reasons can be seen in the below picture. 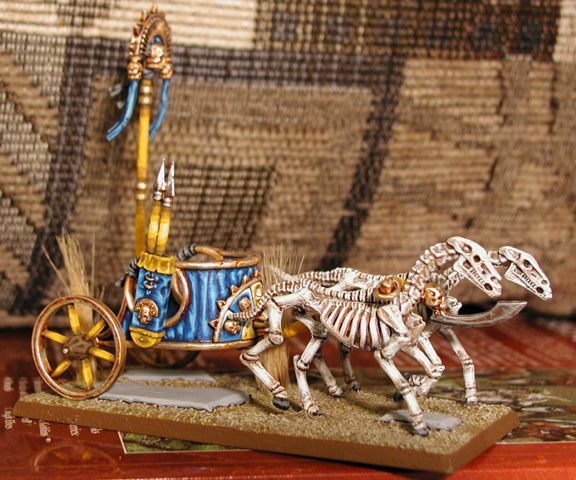 Here you'll see the chariot bases for my Razorgor Chariots. The only way to get the chariots to properly line up with the Razorgor was to raise the chariots up quite a bit. The chariots were otherwise way too low to the ground, and looked puny in comparison to the massive Razorgor. If you are using metal models, or you want plastic models to sit on the base in a very specific way; this technique is a great way to make that happen. Before the putty dries, push the feet of the model into the putty very lightly. You just want them to make an imprint. Then remove the model, and set it aside until the putty cures. Once the putty is completely dry, you will know exactly where the feet of the model should sit. You can use that technique to add variety to the poses of your models. I've done this consistently for the Gor and Ungor. You only have so many different model sculpts to work with. The same sculpt will look a bit different if its front or back foot is raised off the flat base on a putty hill. This technique can be taken a bit further. By building up one side of the base more than the other, you can create a slight cliff edge. These don't have to be placed on the edge of a base either, they can run right down the middle of it. To add the texture to the little cliff face, I use the rough edge of a spare piece of cork. This technique is simple enough for even a beginner modeler to pull off successfully. Coming up next post: Advanced Techniques. This is pretty sweet. I will begin to experiment soon. I was especially interested in how you're doing the rocky look for you reiki and ogres. Will that be in advanced or is that just more of the above? Never mind just found it on the reikland ogre site. That will be on the Advanced Post. Though it's also pretty easy to do, just requires some prep.